The Highland Town Center Plaza splash pad is open Monday through Saturday from 10:00 a.m. to 8:00 p.m. (subject to mechanical issues, health inspections, and/or weather). The Splash Pad will be closed from 2:50 - 4:00 p.m. to allow time for cleaning and regeneration. The splash pad will not be open when temperatures are below 75 degrees, when high winds are present, and when thunderstorms or rain is present. The water will run for approximately 50 minutes then shut off for approximately 10 minutes each hour. Reservations for private parties are not available. Lost and Found items may be claimed at the Highland City Library. Items will be kept for two weeks before they are discarded. 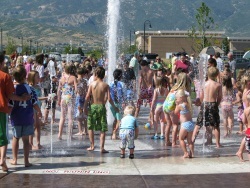 The Highland Town Center Plaza splash pad is located north of City Hall, 5400 W Civic Center Dr (about 10800 N 5400 W). For additional information regarding the splash pad, please contact Public Works at (801) 772-4515.